One of the potential causes for such a deviating trend is pipetting errors. However, imprecise pipetting would have been detected much earlier based on the coefficients of determination (r2) of the standard curves. Inaccurate pipetting might explain the observed drop in average amplification efficiency over the long run if it occurred in between our pipette calibrations or if the inaccuracy fell within the tolerated range of pipetting inaccuracy. To assess the impact of inaccurate pipetting on amplification efficiency determination using dilution series we performed a mathematical simulation study. This analysis indicates that every percentage of inaccurate pipetting (of the template in a 7-point 10-fold dilution series) (e.g. 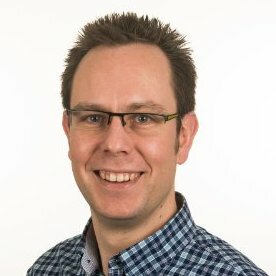 9.9 µl instead of 10 µl) results in an efficiency drop of approximately 0.5%. This may seem small, but for a tolerance on pipetting accuracy of 10% this would increase the fraction of failed assays (efficiency below 90%) by 10-fold (from 1.6% to over 16%). 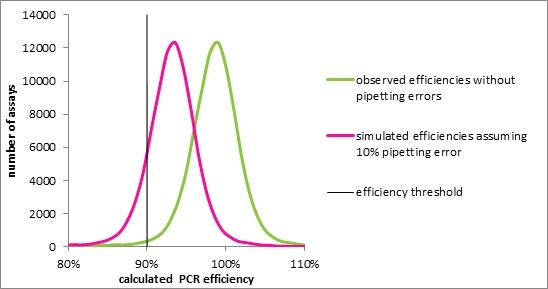 Although the quality and reliability of qPCR, at least when performing relative quantification, does not depend too much on pipetting accuracy (precision remains important though), the assessment of amplification efficiencies from standard curves does require highly accurate pipetting. Indeed, revalidation of our pipets revealed a deviation on one of our pipets requiring adjustment and recalibration, and explaining the observed drop in average amplification efficiency. This event confirms once again the importance of sufficiently frequent pipet calibration to within a small tolerance range for accuracy.